This is just a gallery of pieces I have designed and hand crafted. They are here to inspire you and hopefully entice you enough to want to get a few :-) They are available as CUSTOM ORDERS only. The sizes given are for that particular item, they can be custom made to fit your size. 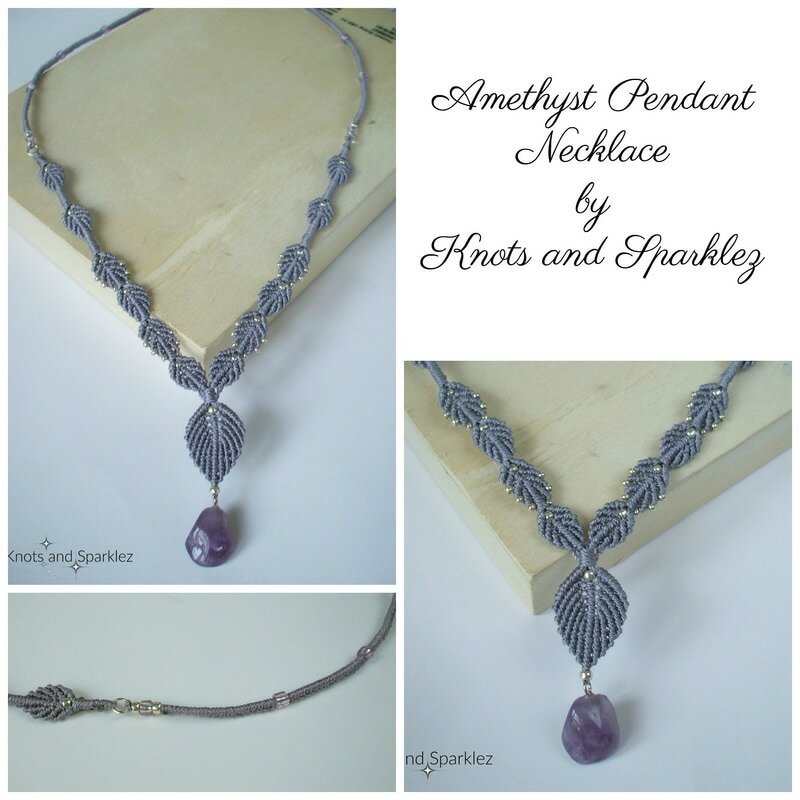 This necklace was born out of a need to use this beautiful Amethyst pendant, the color of the cord matched perfectly and it seemed that the leaf pattern was the perfect choice. It is elegant enough to wear with formal attire, yet simple enough to use with every day casual style clothing. It is about 20 inches long and very light weight with very little metal, only clasp. I had this Opalite pendant that I so wanted to use but I was stuck for ideas, then playing around with this leather cord it just came to me to use it instead of cords, and from then it all came together. The leather part is shaped to form waves that allow for alternated knotting, and give a unique look. It sparkles beautifully in light and the opalite creates a rainbow effect. These are my latest necklace styles. I have had these hand made glass pendants for a while but never figured out what to do with them as they are a bit heavier than what I usually use, so they had been sitting there waiting for inspiration, and all of a sudden it came to me. I used cords color that match the pendant's colors as close as possible, and added a bit of gold or silver accent here and there to beautify it a little. My latest idea, hand knotted WRAP bracelets, one long continuous piece that you can wrap around your wrist as much as 5 times depending on size. These are all different, both in color and style. I always change something to make them all unique. I also have to accommodate for what materials I have on hand that fit. These are made to order. If you have suggestions or request please contact me. These fun and flirty, colorful bracelets can be worn separately or in sets of 4 as you see on the right. These are great for the coming Summer, for parties, events, concerts, BBQ's and your vacations! Match your favorite colors with a bead you like, pick your choice of charm and you have a custom piece to match your favorite outfit. Provide your wrist size and they will be made to fit! These are Singles rather than sets, with various examples of charms and pendants that can be attached. 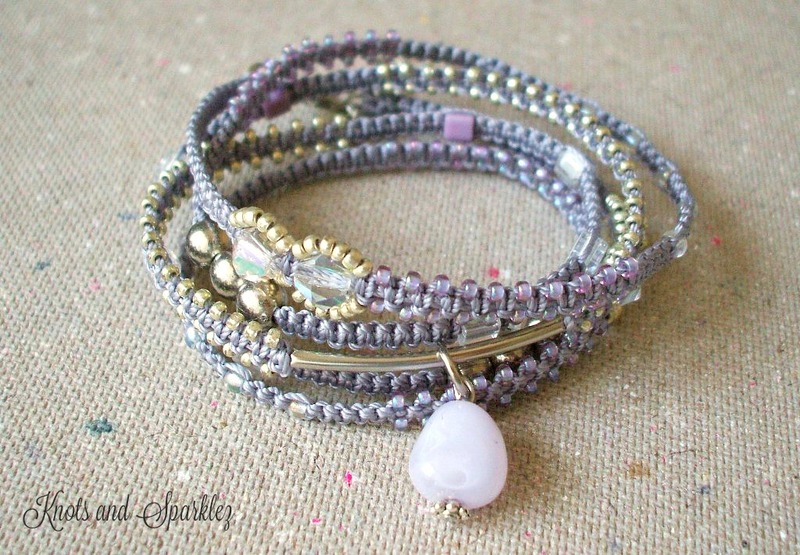 Marvelous colors that match in bead and cords, and will brighten your outfits. Here you can see a similar set to the one on the right, but in silver tones rather than gold ones. I also changed the style of the earrings. COLORS: light gray, white, silver, steel and gunmetal. This is one of the few bracelets I worked on with glass Pearls, never were too fond of Pearls but now I see they have potential. 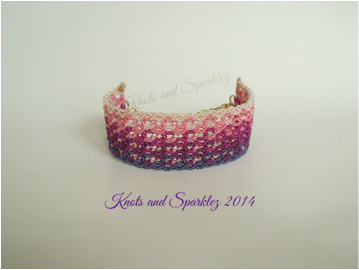 This particular one was created to match the dress for a girl's Prom. COLORS: Vanilla, cream, white, taupe and gold. This hand knotted set is comprised of bracelet and earrings in black/gold tones, knotted on gold toned memory wire for a one size fits all style. The earrings are very light weight and they are about 2 1/2 inches long. 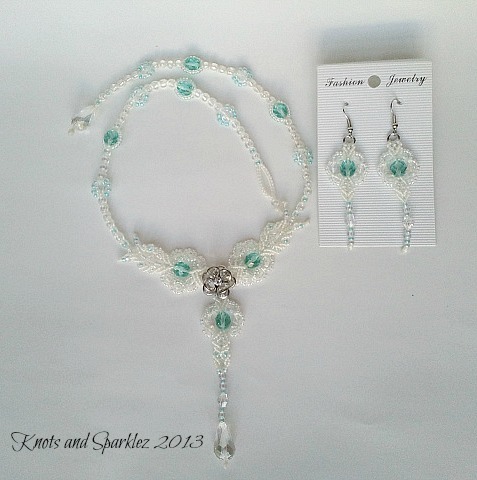 This set would make a beautiful accessory for your night out, dinner party, event outfit. Similar to the black and gold toned set this is in vivid and bright red/gold tones, reminiscing of Ancient Asia and its traditions. It is also knotted on gold toned memory wire and will accommodate all sizes. Earring are very light weight and 2 /12 inches long including the ear wires. Makes a perfect fit for your Valentines Date! Knotted with 5 color cords in similar tones, this cuff bracelet is for those who likes bold and big jewelry. 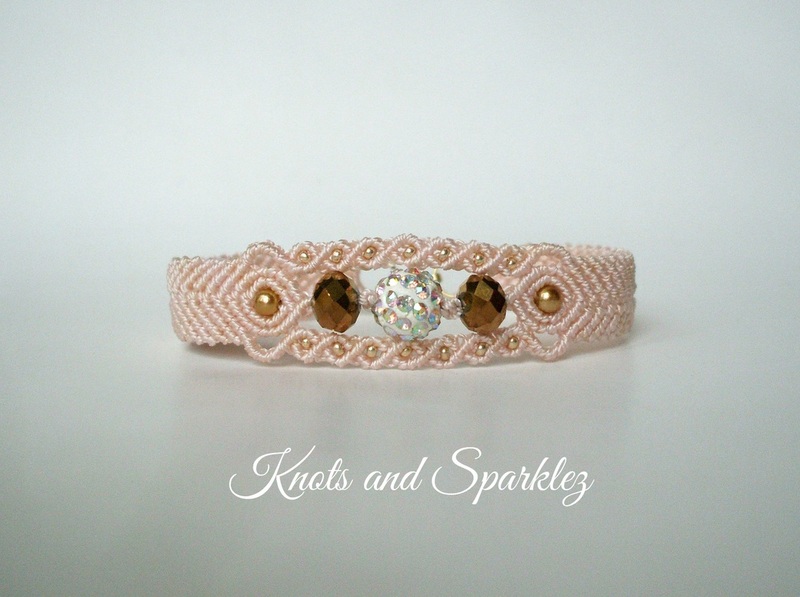 It has tiny rose colored beads all woven in the knots. It can be made in any size. 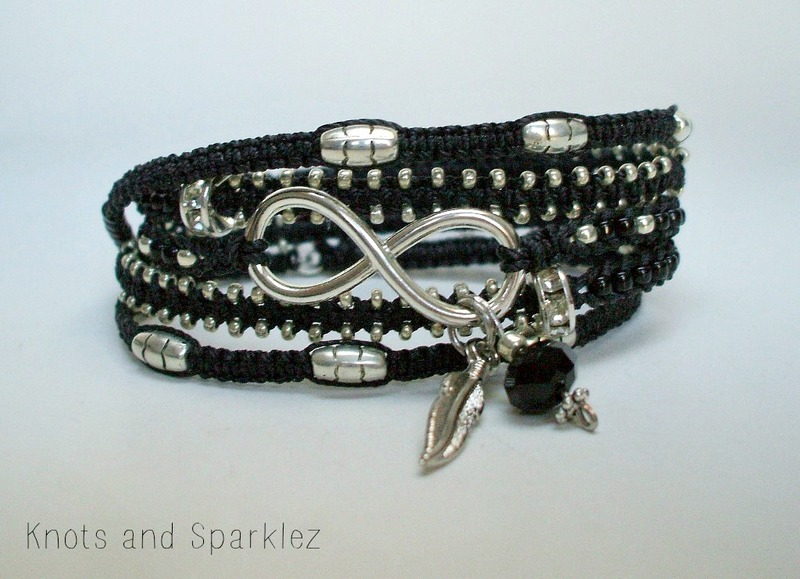 Knotted in the same fashion as the one on the left this bracelet is a bit thinner to suit different taste in size. 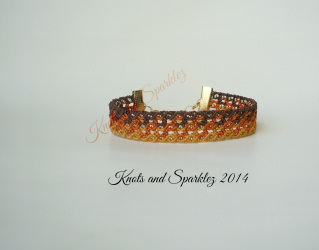 It's in brown/pumpkin/gold tones with a gold toned closure, and tiny gold toned beads. It can also be made in all sizes. These are knotted with 3 different tones of green cords, embellished with emerald tones fire polished beads, and lighter green crystals. A touch of gold, finishes off these stunning earrings. 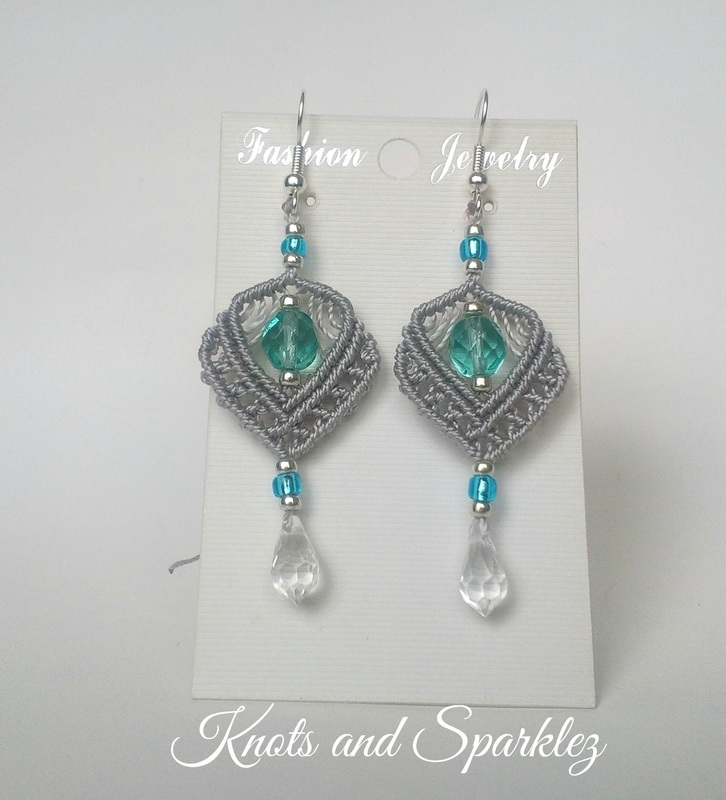 These wings earrings are hand knotted and very light to wear. This particular color combination is perfect for summer, but there are more combinations available. This time the fairy tale is in pink tones. 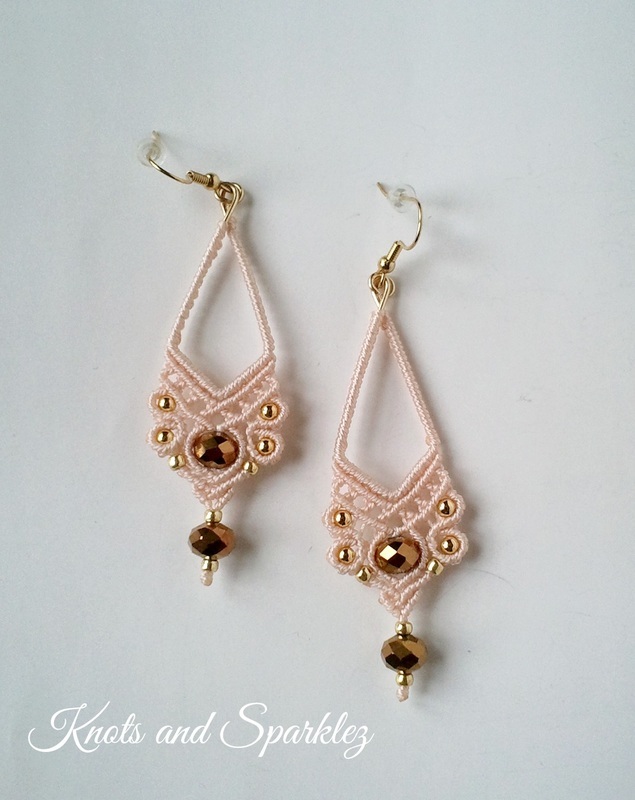 Knotted in 3 shades of pink and rose and embellished with crystals and beads in same tonality, with a touch of lavender. Intense colors of sapphire and light sapphire that reminds of ocean waves. Perfect item for your summer! All Japanese beads with rainbow finish that will sparkle amazingly in any light. Clasp is gold toned lobster claw with an extender chain and a pretty dangle. Will fit wrist from 6 to 7 1/2 inches. Can be custom made to fit different sizes. Here is my newest addition to the family, my Cinderella bracelet. 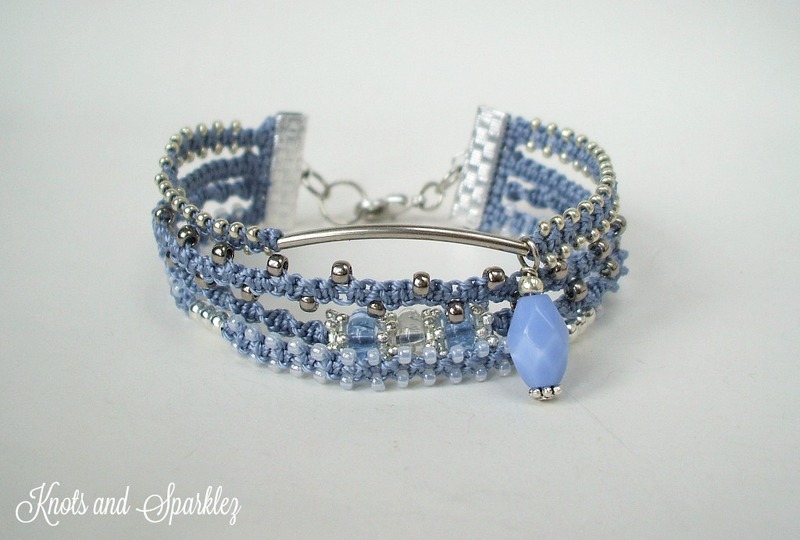 I picked this name since the Azure color remind me of Cinderella's dress, and the Gunmetal color of the smallest beads reminds me of the color of the ashes associated with her name. In real life the colors are stunningly beautiful and full of sparkles a shame it cannot be captured in pictures. It would make a splendid gift for any lucky lady. 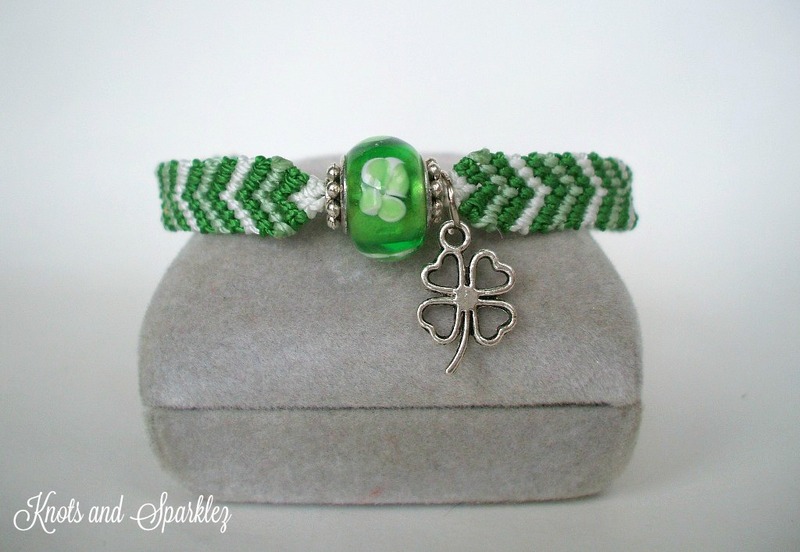 This bracelet can be made to custom fit any size. 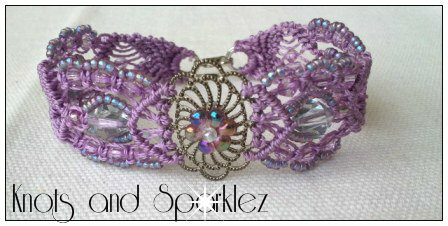 This is the Plum/purple version of the Cinderella bracelet. "Arabian Nights" Earrings and Bracelet. Hand knotted set in intense blue tones with a touch of gold, elegant and unique for any special event or a night out. Can be made to fit any size. 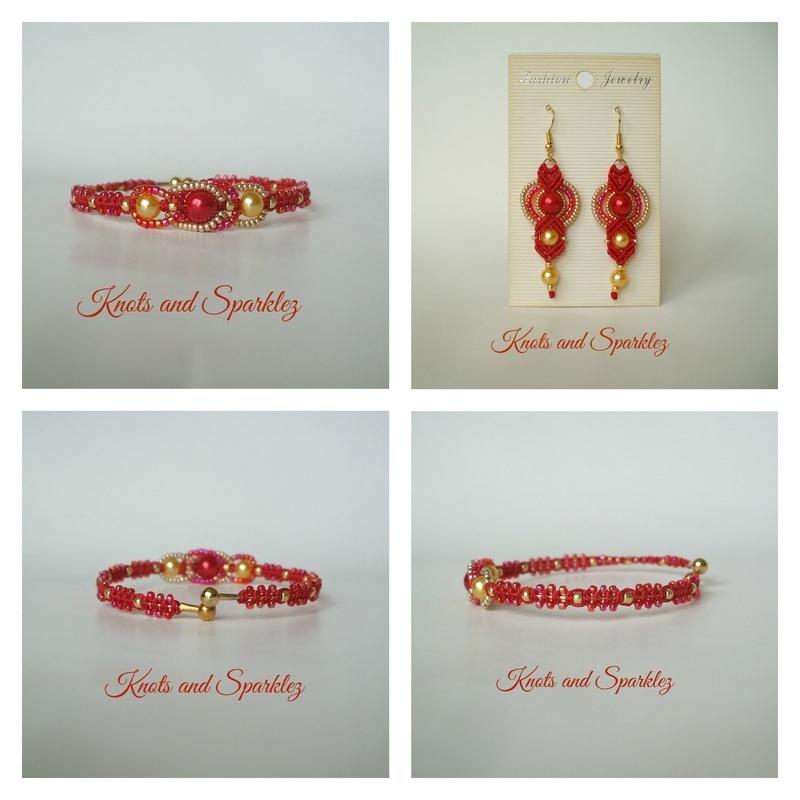 Hand knotted bracelet and earrings straight out of a fairy tale! Pale blue tones paired up with sparkling crystals and glass beads with a rainbow finish will sparkle your way to any event, party, or day at the office. If you think you are a Princess this is for you! Elegant and incredibly sparkly, hand knotted and beaded Micro Macrame Bracelet in white with a pearlized look. I bought the pattern for this one from Knotgyspydesigns, when I was just starting, and used my own choice of colors and beads. Made of nylon cords in snow white, clear crystals, and pearlized glass drop beads. Princess Grace Kelly Necklace and earrings set. One of my favorite pieces. I designed and hand knotted this piece myself not knowing the full design, it just came together as I worked. I started with trying to find a use for the Flower centerpiece and ended up with this design. I called it Grace Kelly because it looks elegant and gracious and it reminded me of her. 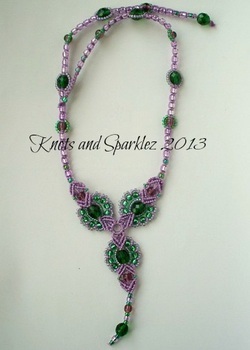 Emerald Green & Amethyst Y Shaped Neck﻿lace. 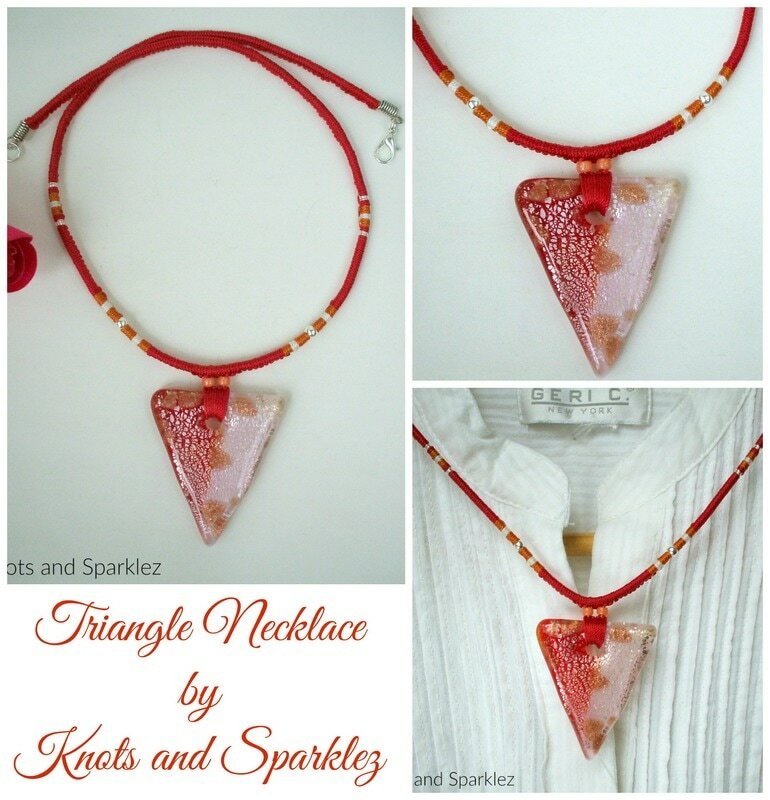 This Y shaped necklace is right for you if you want to make a statement, and love bold colors and color combinations. The amethyst-emerald tones contrast and complement each other perfectly in this hand knotted, beaded micro macrame necklace. 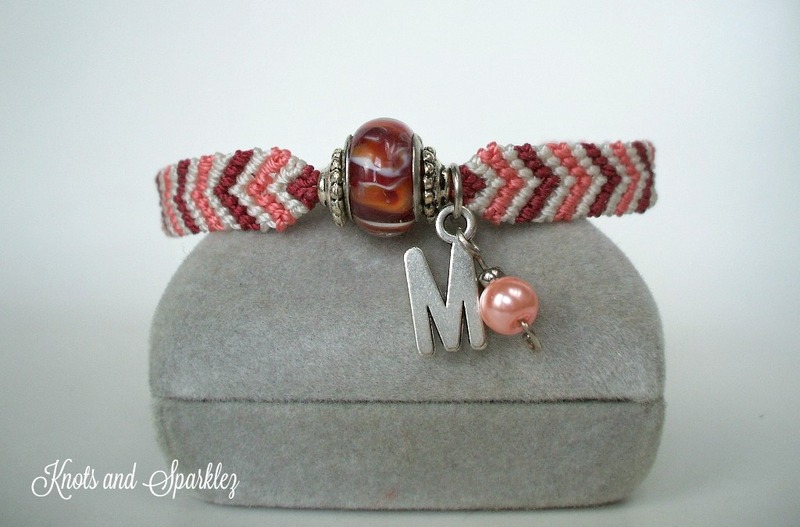 Realized with nylon macrame cords, Czech Fire Polished glass beads, and Japanese glass beads. Again this was one of my first necklaces. I had this pretty glass heart and filigree piece and found a way to combine them with some crystals in various shades of green and a pretty filigree button for the bracelet. It is knotted in a spiral pattern. Hand knotted Cuff Bracelet. Teal nylon cords knotted around honey colored accent beads, with a touch of emerald green and sapphire blue crystals, make for a stunning color palette.A bit more casual and less sparkly. Since it is a cuff bracelet it is supposed to be worn tight and high on the wrist, not hanging on your hand; therefore I kept the length at 6 1/2 in. If need arise an extender chain can be added to accommodate larger sizes. It would make a unique gift idea. After tinkering with a piece of chain for a few days I came up with this idea. 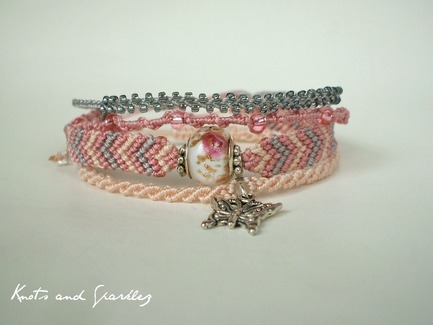 To use macrame knots and beads on chain. 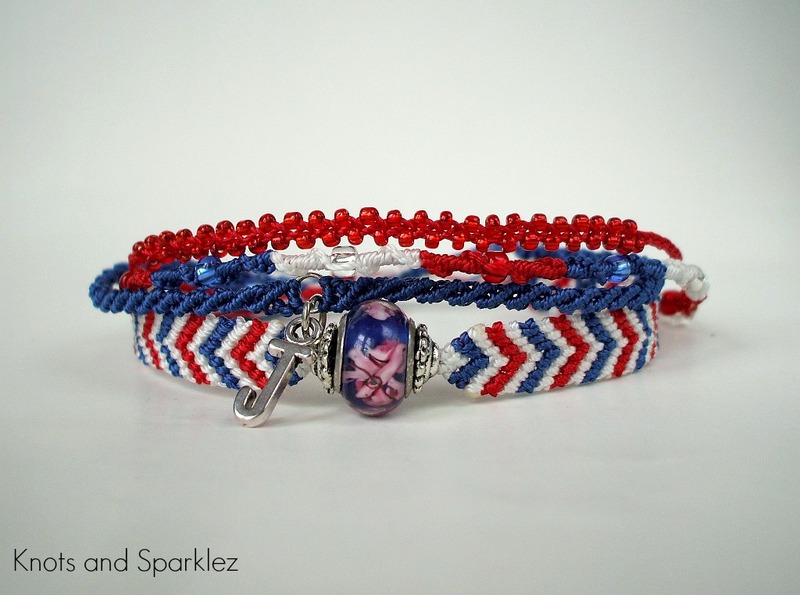 The 2 bracelets in the picture are just 2 possible combinations. I'm working on a tutorial for these. They are both available for sale. 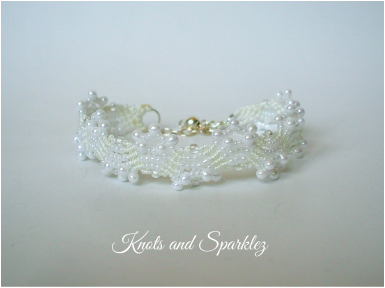 Elegant and incredibly sparkly, hand knotted and beaded Micro Macrame Bracelet in white with a pearlized look. 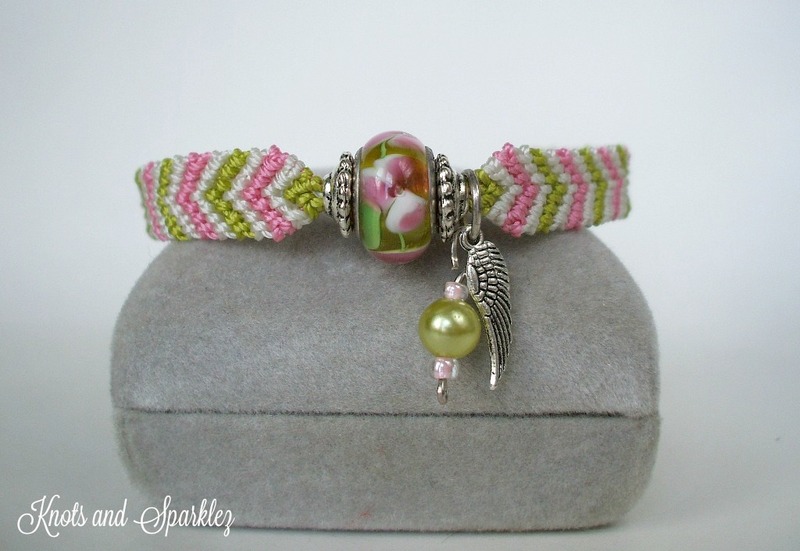 I bought the pattern for this one when I was just starting, and used my own choice of colors and beads. Made of nylon cords in snow white, clear crystals, and pearlized glass drop beads. PS: tutorial for this piece can be found under "Tutorial" tab on top. When I started I had another design in mind but as I worked it turned into this one. The centerpiece is metal filigree which I embellished myself with a self made seed bead flower of matching colors. 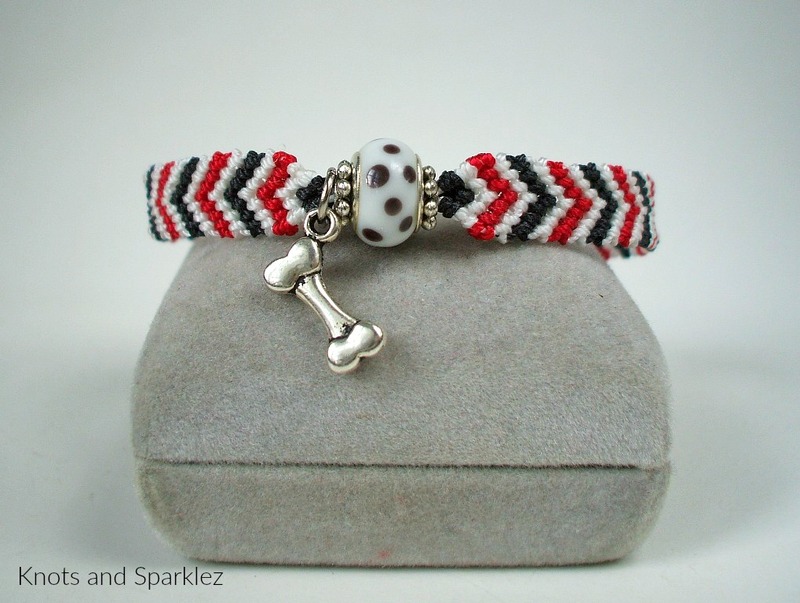 I love the white and red color combination and in this piece the red beads remind me of rubies, it carries an aura of regal jewelry. A classic fan pattern I played with and added a few crystals. I love the results. One of my first bracelets, in bright orange cords, ruby red fire polished beads and a touch of god. 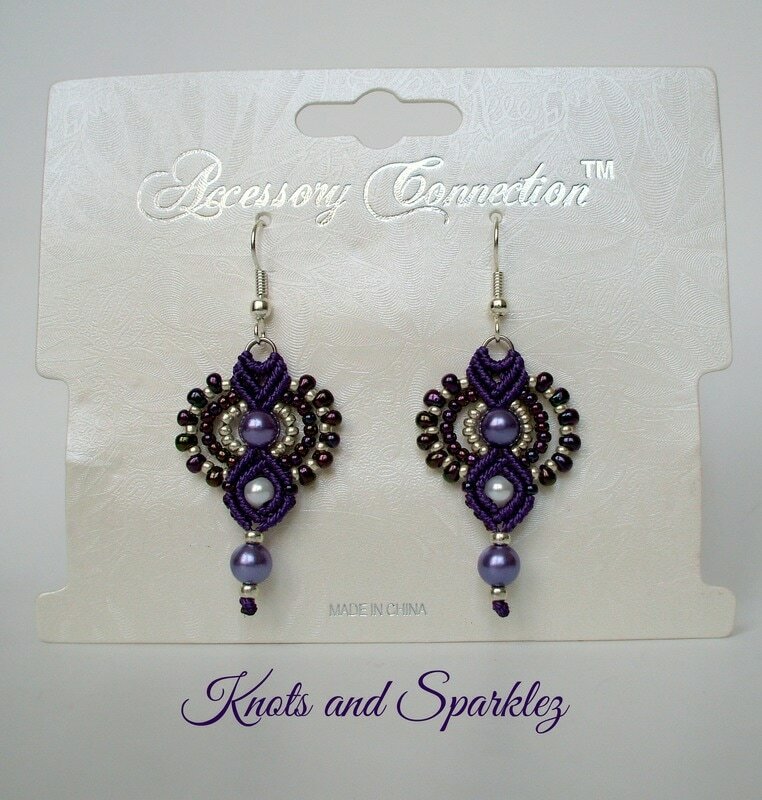 Filigree antiqued button is used for closure, and pretty dangles finish it off. Turquoise is one of my favorite colors, and I love these dyed Jasper stones. It is a simple bracelet but the accents complement the beauty of this stone. Hand knotted in a spiral pattern, with glass beads and stone, it has pretty dangles at the end, and no metal components. I previously made it in Vanilla color but it has been sold, so I tried in Chocolate Brown this time. 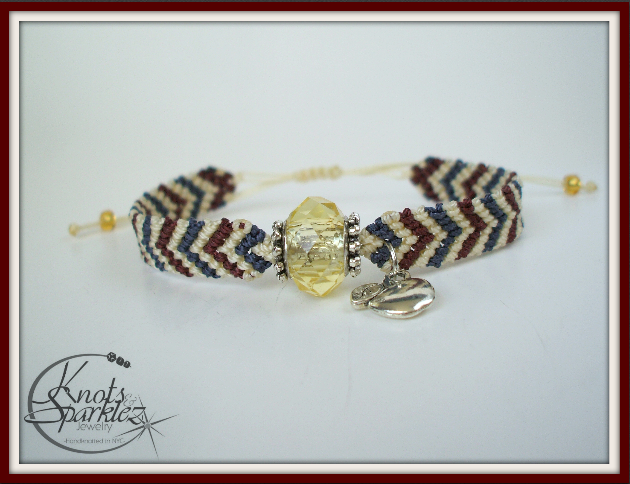 The name came to mind because the colors of the frosted beads reminded me of Egyptian color patterns. 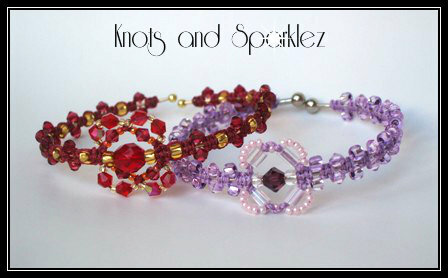 Here are 2 of my bangles bracelets, the orchid colored one is the one you can make from my FREE tutorial; the red one is the newest and the tutorial for it is available at my Etsy store.. 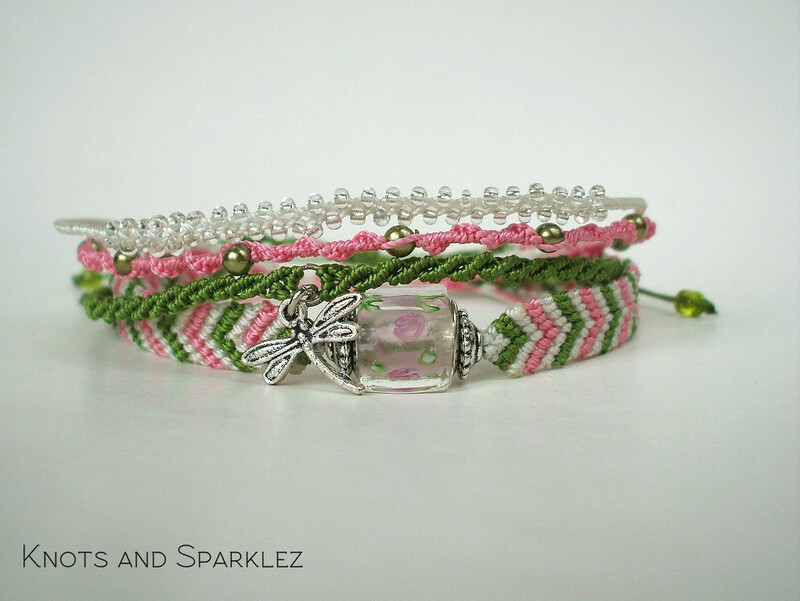 I'm working on more colors and variations of these bracelets.